HEARsmart is proud to have been a valued contributor to the latest edition of Music Victoria‘s Live Music Best Practice Guide, released a couple of weeks ago. Jane Sewell, HEARsmart Manager said it was a pleasure to work with Music Victoria to incorporate the most current thinking and best possible advice for music venues in relation to long-term hearing health / hearing protection for staff and patrons alike. “With the growing number of young people experiencing tinnitus and hearing loss, this really is an important area for us to work in, ” Jane said. The guidelines were originally developed back in 2012 during a Live Music Roundtable attended by representatives of the music industry and State Government. As a key document that has helped Victoria’s live music venues to lead Australia’s live music sector – regular updates are essential to reflect the ever changing landscape and provide robust, evidence-based information for people running venues. Music Victoria – the independent, not-for-profit, non-Government voice of the Victorian contemporary music industry – has worked closely with a diverse range of organisations to ensure their guidelines are relevant – adding or updating information into not just hearing protection but also sexual harassment, hosting all ages gigs, planning law reform and copyright compliance, in amongst other more constant content. 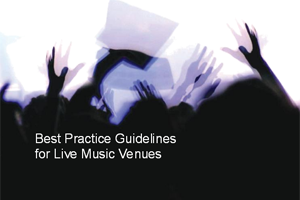 Talking about the guidelines Music Victoria CEO Patrick Donovan said as well as outlining the minimum requirements for running a live music venue, the guidelines provide advice on achieving ‘best practice’ as a live music venue operator. “Helpful advice that can lead to increasing patronage and profits, attracting high-quality performers, reducing noise complaints and help create one-off live music experiences. It’s win-win,” Patrick said. Big congrats to Music Victoria for putting together such an important and comprehensive document – and we look forward to co-hosting the Hearing Health Forum with you on Thursday the 9th June.